first of all I would like you and your followers to excuse my english. As a frenchmen living in Germany, don't be hard on me. Saying that, the first thing I thought about your article announcing the purpose of you doing a blog was "wow, that guy is incredible". I discoverd Starcraft 2 after forgetting I played SC1 and Broodwar for more than 15 years. I accidently discovered there was a nerd actually teaching people about it. And time after time I discover that not only you learn us to be better gamers, you also teach us much more.I follow you since nearly 2 years now and I can't believe each time I see you take the next steps in your (business) life. So the blog was for me a question of time and I am glad I can follow this new adventure with everyone. Yeah I know it may feel cheesy when put into words... So befor I spam your new blog completly, I wanted to thank you for what you do. I encourage the visitors to read your Manifeso, your writing skills are as good as your casting or playing skills. Long live your blog and I wish you a lot of success for this challenge and the next ones too. 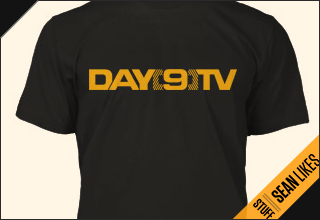 Thank you Day9 for making my days! Blog #1: Why I’m making this blog. First of all, let me start by thanking you all for watching the show and supporting me for the last three years. It’s been an amazing and breathtaking ride and it all happened because of you! When the new blog is posted, he'll send a link to it on Twitter. It's a useful tool for keeping up with news like this.